Whether you practice yoga to strengthen your body, manage stress, soothe anxiety, improve flexibility or find peace-of-mind; adding Reiki (the conscious application of universal life force energy) can increase the healing benefits of your yoga practice. Improve your energy, improve your practice, improve your world! 1 p.m – 4 p.m.
Rhomboid Strength – You need it! “I looked in the mirror and noticed I was turning into an apostrophe.” If this quote describes you; take heart, rhomboid strengthening exercises could be just what you need. 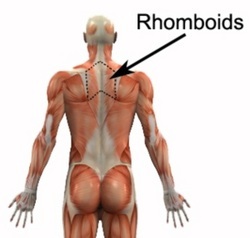 Conservatively, I’d guess 75% of my clients and students have weak rhomboids. Our modern lives featuring hours in front of computers, driving, sitting with poor posture in front of a TV, etc. all contribute to the imbalance where we have overly tight pectoral muscles on the front of our chests plus overly stretched & weak rhomboid muscles between the shoulder blades. Over time, weak rhomboids contribute to poor posture, slumped forward heads and bodies that start looking like apostrophes. For most of us, the best remedy for poor posture is the combination of stretching our pectoral muscles, then strengthening our rhomboids. Begin with the Chest Expansion Stretch; reach both hands behind your back, interlace your fingers and lift your hands away from the hips as far as you can do so while maintaining a straight spine. Almost everyone can (and should) do one minute of Chest Expansion Stretched followed by several sets of Shoulder Blade Squeezes daily. Then as long as you don’t have lower back issues, add in the Dart exercise for better results. Within just a few weeks of adding these 2 or 3 simple exercises to your daily routine, you should notice a difference in your posture. Maybe you’ll notice in the mirror less of an apostrophe and more of an exclamation mark! What’s better in the heat of summer than always having a quick, easy way to cool off? The yoga breath of Sitali – or the cooling breath – can help you cool down your body and feel more comfortable in just a few minutes. 1. Begin in a comfortable sitting position with the spine long. 2. Inhale through the mouth – forming an ‘o’ shape with the mouth and curling the tongue, if possible. Use the curled tongue like a straw, sipping the air inward for a count of 4. 3. Close the mouth, exhale through the nostrils for a count of 6. 4. Repeat 5-20 times, as long as it takes to notice a cooling sensation through the body. 5. End this breath practice by reclining in corpse pose (savasana) for 3-5 minutes. For added cooling, place a cool, moist cloth across the eyes. The next time you get overheated, try the Cooling Breath – Sitali; not only will you feel cooler physically, but also calmer emotionally. Sitali is a handy tool to have to beat the summer heat. There are times when meditating is simply a struggle; we can’t find the time, or can’t find a quiet space, we come up with excuses why not to meditate, we procrastinate… if you’re struggling to meditate, consider walking a labyrinth as a form of walking meditation. Labyrinths are nearly as old as recorded human history; they show up in ancient drawings and design from all parts of the globe. For thousands of years humans have enjoyed labyrinths as interesting design, solvable puzzles, mythological prisons and contemplative practice spaces. The basic design of a labyrinth; as a path that doubles back on itself repeatedly, mirrors the journey of life. In a labyrinth, the destination seems so close; yet inevitably, we have to wind through many twists and turns before arriving. Walking a labyrinth mimics the entire journey of life and provides a tangible, visceral connection to the past. 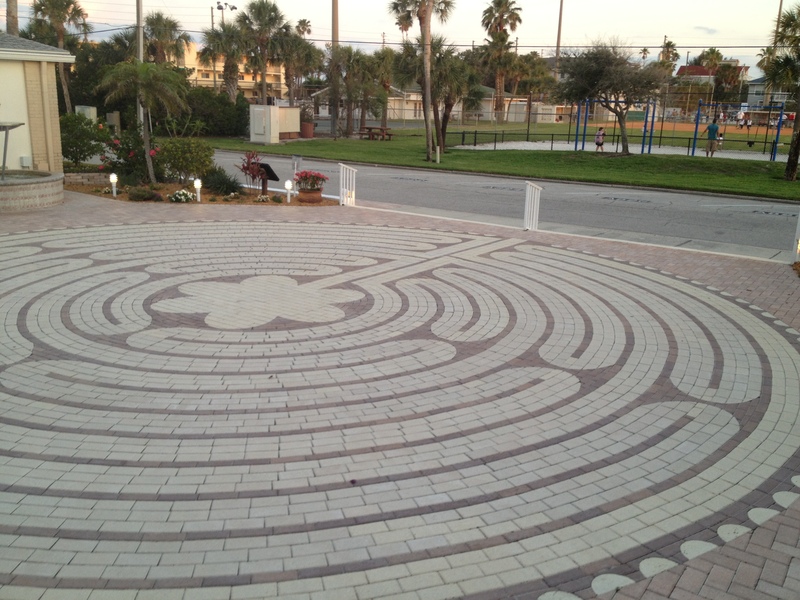 So the process of walking a labyrinth provides us today with the perfect time-out from the busy world. Once we step into the labyrinth, it is impossible to be preoccupied with outside thoughts or worries, the labyrinth demands our complete attention; which is what makes it such a great meditation tool. Most modern labyrinths take just 5-30 minutes to complete; the perfect amount of time for a brief respite from a busy day. Here’s a list of labyrinths all over the world; find one close to you, or location one to walk on your next vacation. Connect yourself to thousands of years of human history while calming your mind and soothing your soul. Feeling congested? Tired? Heavy? Sticky? Try lymph brushing. A healthy lymphatic system is an essential part of overall vibrant health. The lymphatic system works as the body’s clean-up system. The lymph flows through the body in a series of vessels similar to the cardiovascular system. The lymphatic system sweeps refuse and toxins out of the tissues so they can be eliminated. However, unlike the cardiovascular system, the lymphatic system lacks a heart. So the only way to pump lymph through the body to ensure your body is ridding itself of refuse and toxins is by movement. Exercise, walking, just moving your body is the key method of moving the lymph through the body. However, if you have some extra congestion in the body; swollen ankles (and serious health issues have been eliminated by your doctor), chronic aches in the muscles or joints, congestion in the sinuses or throat; a daily program of lymph brushing may be just what you need to feel better. Lymph brushing can be done using either a soft bristle body brush or exfoliation gloves available at most drug and grocery stores. Before bathing or showering each morning, spend 30-60 seconds gently brushing your body. Beginning at the feet and hands, use gentle brushing strokes moving towards your heart. Pay special attention to the bends around the joints, armpits and areas under the breasts. That’s all there is to it; really! Lymph brushing gives me an immediate feeling of invigoration; plus I’ve found I’m much less like to get sinus congestion, and all my body systems feel like they move a bit easier. Several clients have become fans when they found daily lymph brushing eliminated their chronically swollen ankles and have helped minimize sinus headaches. Give lymph brushing a try for two weeks and see what changes in your body. Even if the only benefit for you is an increased sense of vigor and energy; the 30 seconds a day may be a good investment! We completed the 21 day Clean Start 2013 cleanse program at the end of January. Congratulations to all who made it through and picked up some new habits, learned some new information or got to know their own bodies better! Dramatic reduction in seasonal allergy symptoms – I’ve found when I don’t eat wheat, dairy or processed foods, I have very few allergy symptoms. After going through the intense days of physical purging, now when I eat ‘clean’ I feel better than I’ve ever felt in my life; no exaggeration. Even if you didn’t start with us at the beginning of the year, I’d highly recommend the program to anyone at anytime. Simply buy the book, Clean and start on the program. If you’d like some motivation and support, we still have our facebook group going, it looks like there’s a new Sugar Detox Challenge starting in February. I’m planning on doing the 21 Day Clean Program again around mid-year, and…. Jump start 2014 with a 4 day Clean Retreat. Save the dates 1/2 thru 1/6; this 4 day retreat will get you New Year’s New Eating program started right. We’ll feature morning juice & smoothies, shopping for and cooking Clean meals, yoga, massage, meditation and exercise. More details unfolding, but mark your calendars now! Oh, yeah; I should mention something about massage in here….. Offered as either a 90 minute or 120 minute session, the Herbal Compress Massage is the perfect type of session if you’ve been sick, you’ve been stressed or you just need some TLC. Schedule yours now before the outside temperatures heat up! Makes a great Valentine’s Gift – buy a Gift Certificate for someone you love! There’s still time to give your love the sweetest gift of all – massage! Buy a 75, 90 or 120 minute session on a gift certificate. Hit reply to this email and I’ll drop it in the mail today! Isolated eccentric stretching is the perfect solution for so many joint and muscle pains. What I most enjoy about the work I do is being able to witness so many incredible transformations happening in all of you. I have clients who are healing themselves from long-term chronic disease, successfully rehabbing from new and old injuries, managing chronic illnesses with massage, regaining good health after suffering undetected illnesses for years; and it is so incredibly inspiring to watch people heal. It is a profound honor to witness all of your transformations; that’s the humbling part of this work and what keeps me committed. Thank you all for sharing your journeys with me! Part of the rich therapeutic Thai Massage system of bodywork, some say the herbal compress massage was considered to be a ‘Royal Treatment’; a special form of therapy reserved for relieving the pains and strains of royalty and warriors in ancient Thailand. Today’s herbal compresses are a powerful blend of herbs; prai (a Thai root similar to ginger), ginger, lemongrass, tamarind, turmeric, camphor, patchouli, keffir lime and orange. The herbs are cooked and combined into a poultice then wrapped in a muslin cloth tied into a ball with a handle. When the compresses are warmed with steam, the aromatherapeutic properties of the herbs are released. Then the herbal compress is pressed into the skin, following the energy lines of the body, releasing the essential oils of the herbs into your open pores. A multi-sensory form of therapy, a Thai Herbal Compress Massage simultaneously works on the muscle & connective tissue system, the nervous system, the blood and lymph circulation systems, the respiratory and digestive systems. The therapeutic qualities of the herbs help reduce inflammation, calm stress, ward off colds and flu, act as an antiseptic and analgesic, tone the skin and boost circulation; making the Thai Herbal Compress Massage the perfect choice of therapy for anyone struggling to get over the end of the season illness, manage a chronic health condition or simply relax more deeply than you have in years. Adding in a ayurvedic oil massage, heated massage table, hot towels and hot packs further warms the body, soothes the mind and enhances relaxation. If you’ve never experienced the Thai Herbal Compress Massage, schedule one now. If you’re trying to wrap up the last bits of the seasonal illness, struggling through a period of high stress or simply have a body that is craving some TLC; a Thai Herbal Compress Massage may be just the treatment you need. Contact Suzanne directly to schedule your Thai Herbal Compress Massage: www.TryThaiYogaMassage.com, Suzanne@TryThaiYogaMassage.com or 727-641-6941. Neck & Shoulders sore? Upper body achy? The yoga pose commonly called “Chest Opener” is a great way to relieve the strain and stress of poor upper body posture. If you spend all day in front of a computer, driving, sitting at a desk; the chances are high that at times you end up with tension, soreness, maybe even pain, in your neck, shoulders and upper back. The Chest Opener is a quick and easy way to undo much of that stress in the upper body. Start by standing with feet a hips-width apart. Clasp your hands behind your back, interlacing the fingers. Straighten the elbows and begin to lift the hands away from your hips. Take care to keep your spine straight and your head reaching up. Once you’ve found a stretch in your shoulders, hold in that position for 5 full, deep breaths. This Chest Opener pose stretches out the pecs and the deltoids, opens up the upper intercostals and tones the rhomboids; all of which are essential muscular positions for maintaining good posture. For best results, do this stretch 3-4 times per day; it works especially well at the end of the day and at the end of any long stretches of work in front of the computer or steering wheel. Simply adding a bit more stretching and a few more deep breaths into your daily life can make all the difference between feeling hunched over, stressed and achy; or feeling spacious, vibrant and healthy! Want to stay healthy this holiday season? Boost your lymph system! So often the holiday season seems to mean not just parties, gifts and family time; but also colds, flu, coughing and aching. With all the stress, lack of sleep, extra travel, time away from health routines and more time in close quarters with other people; the holidays too often mean the annual colds and flus make the rounds through our homes. This year arm your lymph system to fight off any potential invaders! Our lymph systems run our immune systems; in order to maximize good health, our lymph system needs to be working optimally. A healthy lymph system is vibrantly circulating, gathering up waste materials including germs, and flushing them out of our bodies before we become ill. They lymph system is a circulatory system, just like the blood; but unlike the blood which is pumped by the heart, the lymph circulation system lacks a main pump. To keep our lymph systems flowing and eliminating, cleansing and detoxifying; we need to pump lymph through our bodies. We do this either through exercise or movement. For optimizing your lymph system, move it daily. A simple, easy way to move your lymph is by dry brushing the body. Do this every morning right before you shower. 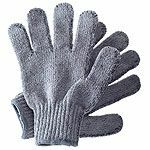 Using either a soft bristle brush or exfoliating gloves; gently sweep across all the skin of your body in strokes moving towards your heart. 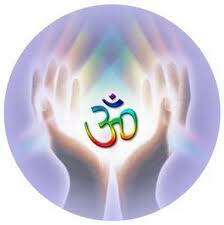 Sweep down the neck and upper chest, along the upper back; steadily moving towards your heart. That’s it! In less than 60 seconds, you’ve given your lymph system a workout. Be sure to drink several extra glasses of water to help move toxins and waste out of your body. Immediately you’ll probably feel a sense of complete, vibrant invigoration. The shower will wash away dead skin cells, and you may notice an immediate improvement in your feeling of wellbeing.